Is Bloomberg a good manager? Taxis will soon have a new tax. Starting Sunday, cab passengers will be forced to pay a 50-cent fee on top of the base fare of $2.50. “It was already out of control. Now it’s even worse,” said Kim Dae, 23, of the West Village, a frequent taxi rider. Apparently, about 4,000 riders already paid the fee without knowing it, as two taxi meter companies had started including the surcharge in its devices, the Taxi and Limousine Commission said Thursday. 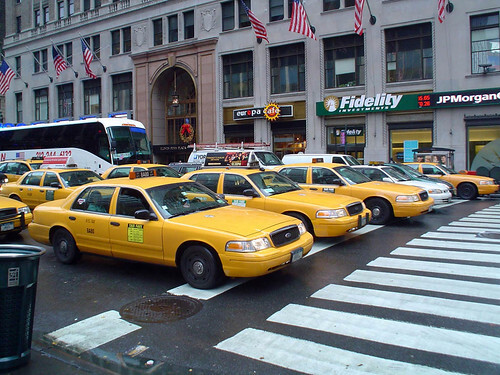 Passengers in 292 cabs were charged 50 cents extra on Oct. 22, 25 and 26. Riders with a receipt or credit card can submit a claim for a refund by calling 311. The tax, part of the MTA bailout passed earlier this year, is expected to raise $85 million annually for the agency. Taxi drivers are livid about the new fee, saying it will be difficult to collect and hurt their business. They are also fuming that new door stickers list the initial fare as $3, making it seem like drivers are getting a raise, said Bhairavi Desai, director of the New York Taxi Workers Alliance, which represents 12,000 drivers. “We think it’s deceptive,” Desai said. The tax will be itemized on ride receipts, and listed on the interior TV screens and rate cards, a Taxi and Limousine Commission spokesman said. “The TLC will continually monitor the proper implementation of the meter change,” the agency said in a statement. The fee is among a basket of taxes that staved off a massive subway fare hike earlier this year. “No one likes a tax, but no one likes a sky-high transit fare or cuts to service either,” said Gene Russianoff, of the Straphangers Campaign. Andrew Vacca contributed to this story.